In a large bowl, mix together 2 cups of the Bisquick™, milk, eggs, and the zest of each of the key limes. Stir in the white chocolate chips. Heat a griddle or cast-iron skillet to medium heat and cook the pancakes according to package directions. In a small bowl, use a fork to combine the last 1/2 cup of Bisquick™, the powdered sugar, and the melted butter. Mix together until the a coarse, crumbly streusel results. 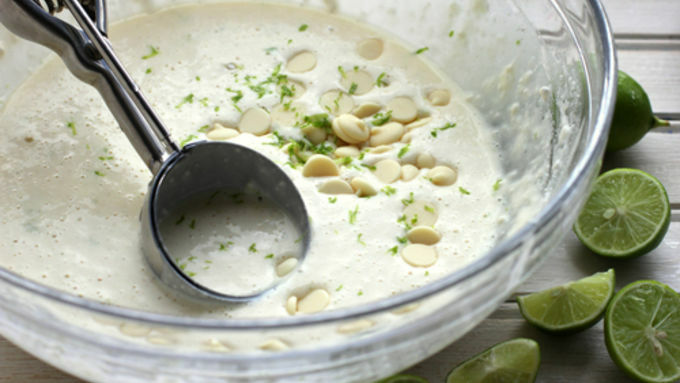 In a small saucepan, heat the coconut milk, sugar, and juice of the key limes together until the sugar is dissolved. Serve the pancakes topped with streusel and coconut syrup. Enjoy! Looking for the next great breakfast? 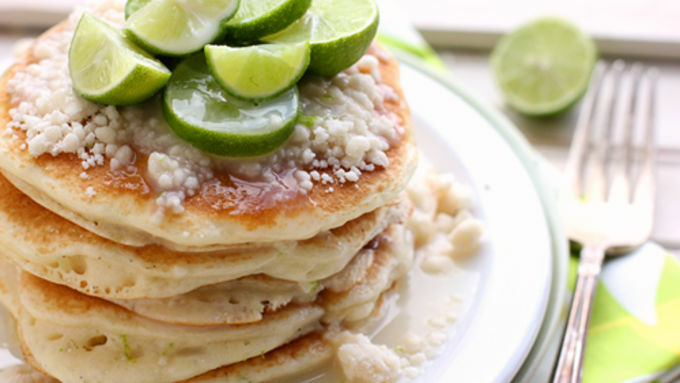 These Key Lime Pancakes are simply going to knock your socks off. 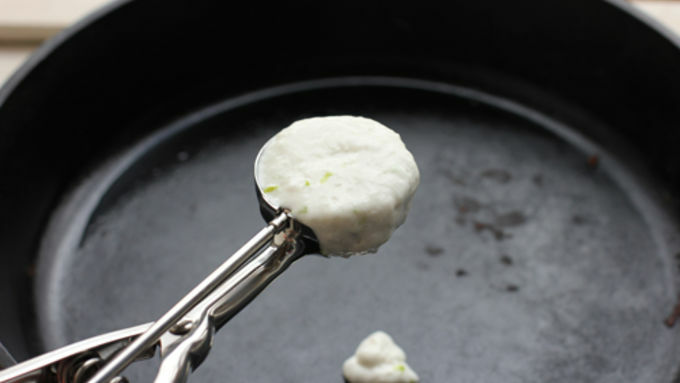 Even better than a holiday in the Caribbean, the flavors of key lime, white chocolate, and a freshly made coconut syrup in this Key Lime Pancakes recipe will make you feel like you’ve treated yourself to the ultimate getaway. Of course, if you’re going to feel like you’re on vacation, you’re breakfast table had best be set with something utterly splendid. Just a plate of pancakes won’t do. And, while a drizzle of creamy coconut syrup is a nice touch, what really sets these pancakes apart is a simple, buttery streusel topping. A handy dandy tip: To make sure all of your pancakes are even in size, use an ice cream scoop to plop your batter from the bowl to the griddle. Perfect pancakes every time! Now, what are you waiting for? You deserve a vacation. 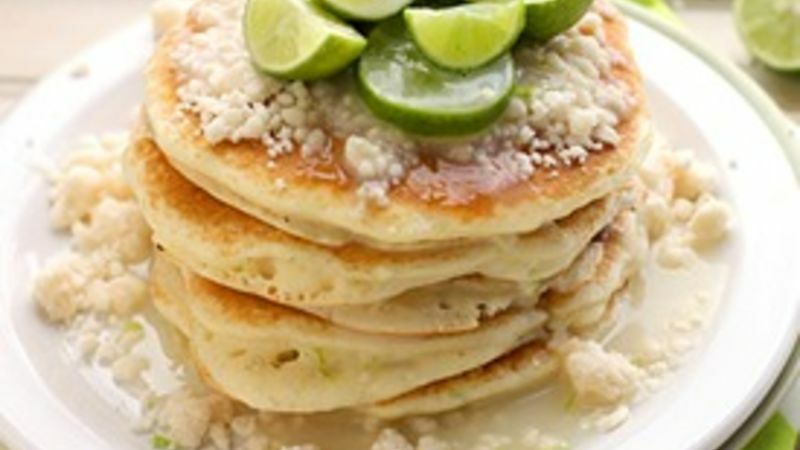 Mix up a batch of these Key Lime Pancakes today and let the yum begin. If you’re crazy for cakes, try a few more on for size!